I couldn’t help myself but make a comment to him that he needs to wake up. Most of you already know I met my beautiful and gorgeous second wife Pam through Facebook. If you don’t, click and read my Young Love – Never Too Old post and wonder in all it’s magic. So I’m really OK with Facebook when it comes to dating and meeting new and wonderful people. Before I met Pam, I used the Facebook Social Network exclusively to meet new ladies and it was a good process. 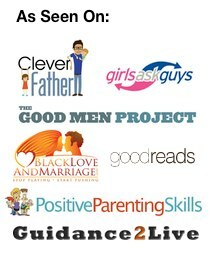 Whether you’re a woman or a man, dating can be a time consuming activity so smoothing it out into a process saves time and energy. So, Facebook worked magically for us. When I say ‘magic’, just look at the person my wife is – she is magic … she is my love. Here comes the con though …..
Love, or the hope of love, has a tendency to blind us from reality. I recently stumbled upon a Public Facebook status conversation between a woman I approved as a friend and a guy she knew. From the outside looking in, it read like a woman dangling a worm in the water and waiting for the fish to bite. This really does remind me of a post I did back in August 2010 when she was getting Random Guy Flirts on Facebook. It was blatantly obvious she was luring the guy and the guy hadn’t a clue. I couldn’t help myself but make a comment to him that he needs to wake up. Thankfully, it worked too. He gathered his senses and told the woman (if it was actually a woman behind the identity) it was over. A few days later (probably a coincidence), I get someone both comment on my cover photo – that’s the one with myself and Pam in the shot, saying they (she) would love to know more about me. Then I get a random Private Message from the same person saying ‘I will love to find the right man to spend the rest of my life with.’. 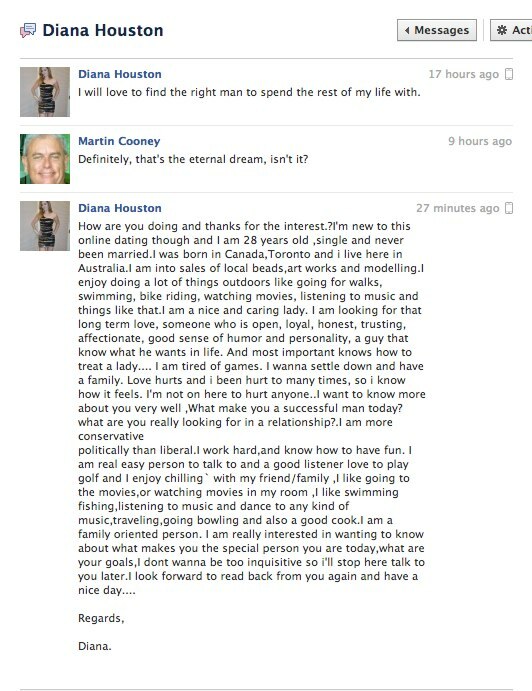 Well, the reply from her was unexpected and tells the story of more Facebook Dating Scams. Check the screenshot below – click to enlarge is a good thing. The reply I got from ‘her’ was suspect, to say the least. So with my enquiring mind, I went a hunting. Let’s simply check her profile as a start. Follow along with me here and make any comments if you agree or disagree. I love the saying ‘If it smells like a fish then it probably is’. If this smells like a Facebook Dating Scam then it probably is. 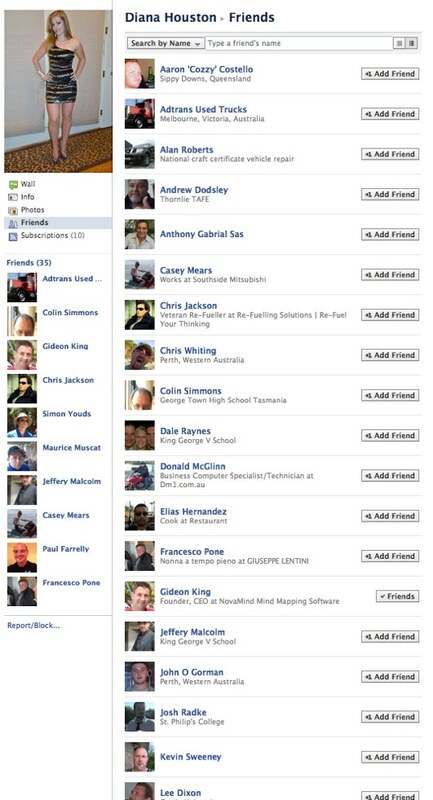 Have a peek at ‘her’ profile and in particular, her list of friends. Click the image below to enlarge. See anything common, like they’re all guys? What Happens To a Guy's Common Sense? I don't know about you but I'm 53 years young. Yeah, I'm an older guy who loves my lady. I'm pretty sure some 20 or 30-something isn't likely to see me and immediately launch into an instant ‘love at first sight‘ Facebook message. So why do guys drop their load when it happens to them and go ga-ga ? Social Media is wonderful to connect with friends. 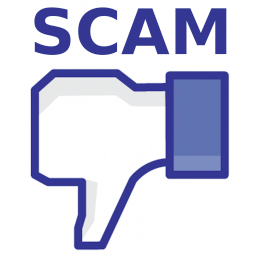 Social Media has also become a rampant disaster for cons and scams, especially Facebook – I see it growing, more and more. So why do guys lose common sense when approached by what's obviously a scam? Have you been approached on Facebook by some random person looking to hook-up? Do you know anyone that's fallen prey to these scammy characters? What happened? Scams on Facebook!? Its not like anyone ever lied online, or in real life during, before and after a relationship …in any type of relationship for that matter. Personal, business, etc. I’ll admit the internet makes it easier to fantasize and lie – after all, actually talking to and meeting a person requires a different level of commitment to the fantasy (or lie). However women were lying to men and men were lying to women long before Facebook. Remember personal ads? Probably happened there too, albeit a lot slower. Coming from a guy who doesn’t do Facebook, or tweet, or anything social media wise, please take this for what it is worth (see above). Thanks so much for what must be, by your beliefs, an utterly valueless opinion, Chris. First, how dare you devalue another person’s beliefs and right to engage and express themselves, with the knowledge they have to impart and freely offer, of themselves. Is this the mindset you employ in everyday life? Lastly though, people lie with their own agendas in mind. Maybe it’s to initially protect themselves online (which is on the good side of things) and people lie online to get purely for themselves and target victims, impacting the victims in a very negative way, eventually. That’s negative and borders on evil. People have indeed been lying to other people, for ages. Does that make it right though? No, it doesn’t. And if lies continue in a relationship without a focus to mend, rectify and move forward then you’ve got a serious problem with the person that’s doing the lying, haven’t you? Lies are bad news, no matter how you cut it. Pathological liars are the same. Whoa, there cowboy! I must have hit a nerve (not my intention) and frankly I thought you’d be a bit more restrained …or at least have provocation before going on the attack (and perhaps ‘attack’ is too strong a word. The ‘how dare you’ was fairly provocative …I’ll talk about that further down.). This is one of the reasons I’m not a fan of ‘comments’ – too hard to convey tone in a few hundred words. Although you seem to have no problem with making assumptions on my mindset based a few paragraphs. My point was that lies by social media are no different in their essence than lies told by print or face to face, they are simply easier to spread. Considering the effort it takes to keep a lie straight over time, I surprised that more relationships haven’t imploded because of social media …and maybe they have, I wouldn’t know. Thus I know my own ‘value’ when it comes to commenting on something like social media. You seem to use it quite often, and by way of experience your opinion would hold more value than mine – especially to the readers of your blog. Finally, yes I do dare. All the time. I try to think before I speak and I try not to be hurtful. Do I go around and ‘devalue’ other people in the course of my day? Of course not. Will I throw the bull$hit flag if needed? Yep – and quite often depending on the situation. My friends can count on me to be honest and direct …downright blunt if I have to, and usually only if asked. However, the world is filled with self-delusional people who feel that their opinion is valuable to everyone else. I see it daily in business: The new employee who is sullen because they are told to ‘listen and learn’ during project discussions, or a coworker who thinks they “can run things better” while they still can’t perform basic functions of their job. (I also see it in relationships, but that isn’t as cut and dry …and far more intricate.) Why is this? Partially (or more likely, mostly) because they’ve been told from a very young age that everyone is equal, and they are special which gives rise to the belief they deserve this or that because the person next door has one. Really? Everyone is equal? We’re not equal (my friend recently pointed out that she was a hell of a lot more equal when it came to breast feeding her newborn son than her husband) and thank God for that! I love the diversity of this world. I stand in awe of people who overcome hurdle after hurdle and make their way in the world as they pick themselves up and try again. I will cheer them on until I am hoarse. Meanwhile, the whiner who thinks they deserve to be heard is still lying in the mud crying because the world isn’t fair. For the most part, I won’t waste mental calories on these types of people. Thanks for the venue, I’m all commented out. Enjoy! Nice to get your reply. You didn’t hit a nerve nor was I attacking you and your assumption of me being provocative is entirely your opinion, which you are more than entitled to. Like anyone else that cares to freely express themselves, here or anywhere else on the Internet. I stand by statement about valuing other people’s opinions. And like you, I’m honest and direct so maybe you need to take that onboard instead of you assuming I’m attacking you as opposed to the expression of my own opinions and viewpoints. Aren’t they the very same values your own friends find endearing in you? – that’s a learning for you, mate. OK, first you make the bold statement that ‘other people’s opinions have the false belief of value‘ but now you’re changing the tune to be a position of perspective and degree. OK, cool. I still disagree and here’s your doctor’s analogy. If your girlfriend disagreed with your doctor’s diagnosis, would you tell her to mind her business or listen to her opinion? Any normal person in a functional relationship would work with their partner and hear them out and, probably, seek a second opinion. That’s the value of opinions, no matter who they are from. Agendas aren’t an online thing either. Agendas (the negative kind and what this post is focused on) are usually personal and steeped with motivation towards a secret and rarely articulated objective. As you say, you don’t get out much when it comes to Social Media so that’s probably another learning you can take away from all this, from an education point of view. People who lie online as well as in a relationship don’t spread that news, at all! It makes the lies contained and minifies being discovered. Half truths are far more believable and convincing. Thanks again for your welcomed comments and engagement. Thanks for stopping by and having a comment, Donna. Yeah, it’s unfortunate that the Internet and the world is populated by a lot of people that are just looking for a target. You were one of the lucky ones who saw the signs early and didn’t get caught. There’s an awful lot that taken though. How’s your search going after this incident? The topic is a very important topic. So thanks for bringing it up. But the examples you gave doesn’t really show any scam. The fact that a much younger lady is interested in you doesn’t immediately make it scam. From the email I read from her to you all I see is a lady desperate to settle down. And yes, there are many ladies who as a result of multiple bad experiences with younger guys now prefer to go for much older men. It’s a common saying in my country now that older men are more likely to be mature and treat a lady right. So I don’t see the scam, sorry. And a scam should be a scam before you expose someone like that. I could be mistaken but from all I read I see honest thoughts from her so I really don’t think it’s cool just sharing her privacy like this when it’s not a confirmed spam. It’s kind of letting her down. Put yourself in her shoes, you showed interest in someone and suddenly you see the private message you sent the lady being exposed to hundreds of people. Honestly how would you feel? I’m sorry this is just my opinion, I believe in giving people the benefit of the doubt until clearly proven otherwise. Moreover it takes a lot from a lady to show clear interest in a man and when she finally does to be treated like this is not just fair. Keep in mind I’m working with the information you provided. She only has 35 friends and all male. I’m like so? What if her sole purpose for signing up to Facebook is to meet men? You said you used Facebook “exclusively to meet new ladies” so will it be wrong if you choose to have all female friends? Think about it, you really have nothing concrete. My purpose for using Facebook is very clear. I’m there just to network. I do online writing full time so I’m always more interested in the business aspect of Facebook than chatting with friends. But I try to confirm friend requests (the ones that appeals to me) as they come in and comments. And of course sometimes I spend a few minutes chatting when someone that seem responsible catches me online. And I’ve met some interesting people through Facebook. And I’m even in a relationship with one of such interesting people now and things are going well I must add – He’s so open as much as I am. Communication is great and his humility is amazing. But sure there are scams. One major one happened to someone from my country recently where she was allegedly raped and killed by the guy she met on Facebook and traveled down from her state to do business with. So terrible things happen. Be careful is the word of caution. Watch what you post and what you comment on. Even if you’re single and searching, don’t do it so blatantly. I have gotten some few interests from people I’ve just casually chatted with over time. And that’s without even putting myself out there to get it. Thanks so much for your lovely words, Shiwangi and I’m glad you enjoyed the post too – as well as the other one. Great post! I enjoyed the story, as well as the steps you took (and screenshots, lol) to uncover the scammer. Not only is it well-told, but it’s also a terrific lesson. Scammers come in all shapes and sizes, and in every medium. Even meeting someone face-to-face, dating, and entering a long-term relationship can result in being duped. But it seems to be a much more common story these days with the anonymity of the internet being so easy. Glad you enjoyed the post, Melissa – please do share it too. The first warning sign was this woman commented on my Cover Photo which very clearly has my wife and I in it – don’t know about nervy or just plain silly. That said, if I were to contact, ‘she/he/they’ would know I was a likely target for their scamming – and I guess that’s the best approach to quickly weed out the people who won’t fall for the scam. Oh, and do get yourself a Gravatar too. Unfortunately scammers are always going to be out there. The medium doesn’t matter; whether it’s online, by email, over the phone or in person, dating and romance scams appeal to your romantic or compassionate side and use emotional triggers to get you to fall into their “trap”. Some scammers use very smart and psychologically proven techniques to get you to lower your guard, which can often be hard to detect and extremely difficult to resist. A common construct is what’s referred to as a “yes set” followed by a “compliance set”. It works like this: If I can get you to say “yes” several times (usually 4 times in a row will work) you are then more likely to say yes to my next question. – Can I add you as a friend? – YES! See how subtle that was? If I’d just opened with can I add you as a friend. Well, you’d be far less likely to say yes. Once you’ve completed a “yes set” you are now in a state where you more likely to follow (“comply”) with my commands. And similar to above, I’ll subtly get you to “comply” 3 or 4 times (the more times the better) and then hit you with the big one. – I’m going to send you a friend request, make sure you add me. – Check out this link. – What do you think about my picture? email me to let me know. Without you even realizing; you are following commands like a sheep. So your defenses are down when they give you an “unusual” request. You could fall victim when you know you would never normally be prone to this kind of scam. “how did I let that happen?” you might ask… well, now you know! – Do you think that’s a good comment, David? – Are you a good guy? – Can you send me a million dollars, in small unmarked bills? Yeah, it is subtle and certainly these scammers know what they’re doing in luring in unsuspecting people who are eager to find that special someone. I read recently that they also have a filtering system, to more quickly determine those more likely to fall for their schemes. A bit like if someone replies to someone from Nigeria then they’ve obviously not aware of all the dodgey things going on there so they’d be on the hitlist. For those that don’t respond, immediately off the list – making the scammers job better because they can concentrate their efforts on the ‘warm leads’. Well, not yet on Facebook, but I’ve got a whole lot of such email scams. Though I read the whole thing written (sometimes it’s exciting and sometimes pretty much boring), I NEVER reply ’em as I already know what it is! I certainly do get the same as you’re experiencing with emails, Raaj. My email address has been around as long as the Internet so you can just imagine the number of Spammy lists it must be on. Whoa! Never got any on Skype yet! Maybe I’m not as good looking as you! Though I’m really more interested in your views on the 3 closing questions. I should also ask about what did you think about ‘her’ approach as well? Strange she started ‘making the moves’ on a Cover Photo that featured myself and my wife. Bizarre.